Roller coaster enthusiasts should anticipate great new rides for the 2013 summer season. Get your tickets and head out to these amusement parks offering the latest hair-raising roller coasters. Six Flags Fiesta Texas stakes a claim on the first ever inverted barrel roll. The Iron Rattler, located in San Antonio, is a “hybrid coaster,” incorporating a steel track on a wooden structure. This beast propels you to a heart-stopping 70 mph. If that’s not enough, the four overbanked turns are unique to the Iron Rattler. Not failing your expectations, the hybrid coaster provides speed, twists, turns, and even a 171-foot drop. However, even steeper than the drop are general admission ticket prices at $63.99. Not to worry, though; online prices drop to $43.99 so you won’t miss a great attraction. 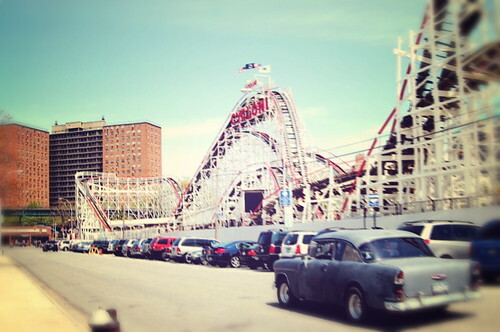 Known for “family-style” fun, classic coaster lovers are given a reason to rejoice! This is not fairy tale play land. In a world corrupted with modern steel rides, California’s Great America presents Gold Striker, showing that wooden roller coasters still have what it takes to compete for thrills. As northern California’s tallest wooden roller coaster at 108.2 feet, you will feel your adrenaline pumping to the record speed of 53.7 mph. This retro coaster does not disappoint. For about two and a half minutes you will spiral down the first drop of the 3,197-foot racketing monstrosity. Enjoy the terror for $39.99 daily. While in the Golden State, stroll the boardwalk to ride one of the most anticipated roller coasters. The Undertow is expected to showcase at the end of July at Santa Cruz Beach Boardwalk. Speed is not the main attraction as Undertow reaches a limited speed of 40 mph. Brand new in northern California, you will get to experience a 360 degree spinning roller coaster. Included in the rotation is the Immelmann Turn. While spiraling down a 1,410-foot track, you will take a sudden 80-degree bank, twisting your reality. Depending on where you’re sitting with six other passengers, you’ll be screaming at the sky or the ground. Grab an All-Day Rides wristband for $31.95 before tax. Not to be outdone in the south and west, Northerners have a local option as well. This record breaker is a quick trip to Cedar Point Peninsula in Ohio. Topping at 67 mph, this ride lasts almost three minutes, twisting and turning all the way. You will be screaming down a 164-foot vertical drop, the longest of any wing roller coaster. A wing ride roller coaster differs from a traditional coaster by suspending riders on the sides of the track. The seats hang on either side of the rails like wings. The Gatekeeper will test your limits with riveting 180-degree turns and a 360-degree inline roll that causes passengers to flip, experiencing a completely different ride. A single adult ticket for the 4,164-foot coaster is $54.99 at the gate. Last but not least, the Midwest competes with other parks with the Outlaw Run. Its $10 million coaster sets the record of second-fastest wooden roller coaster at 68 mph. However, you won’t notice the speed because you’ll be upside down. Before you can recover, the train plummets over 16 stories. This ride incorporates a stagecoach theme, enhancing the fun to the one-and-a-half-minute, half-mile adventure. Riders 12 and up will pay $62.34 for park admittance. Don’t waste your time waiting in line for disappointment. If you want the feel of flying in clouds before your stomach drops to your feet, head straight for these amazing rides. Rhonda Berringer blogs about construction project management and terminal design with Audubon Field Solutions.